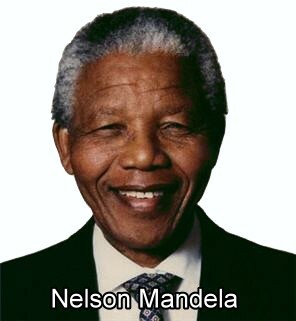 Nelson Mandela was born on 18 July 1918. He served as President of South Africa from 1994 to 1999, and was the first South African president to be elected in a fully representative democratic election. Mandela was not afraid to challenge things that were wrong and he suffered for his beliefs. Mandela grew up in South Africa under system of segregation called Apartheid. Non-white people couldn't use libraries, beaches, parks and toilets that were reserved for white people. Black people and people of mixed race could not go to school with white people or play on sport teams with them. All the rules of the country were made by white Africans. Nelson Mandela dedicated his life to the struggle for racial equality in South Africa. He spent 27 years in prison for opposing the South African system of segregation. Today, thanks to the self-sacrifice of Nelson Mandela, apartheid has been outlawed. Everyone in South Africa now has an equal opportunity at home and at work to live comfortable, productive lives. Nelson Mandela is one of the world's true freedom fighters, and his life and personal triumphs will be remembered for many years.